Sarah Nader- snader@shawmedia.com Emily Marks (left), 13, of Cary, Alyssa Tramuta, 11, of Huntley and Savannah Kurkowski, 14, of Crystal Lake listen to the swim instructor while attending the Spring Swim Team Stroke Clinic at Sage YMCA in Crystal Lake Thursday, April 14, 2016. Sarah Nader- snader@shawmedia.com Michaela Pieroni, 15, of Crystal Lake swims a lap while attending the Spring Swim Team Stroke Clinic at Sage YMCA in Crystal Lake Thursday, April 14, 2016. 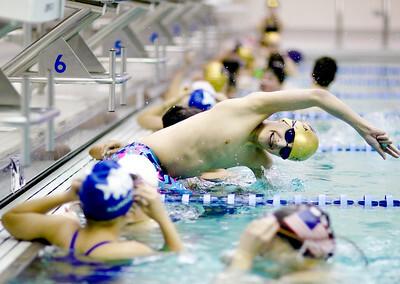 Sarah Nader- snader@shawmedia.com Zach Taller, 11, of Algonquin swims a lap while attending the Spring Swim Team Stroke Clinic at Sage YMCA in Crystal Lake Thursday, April 14, 2016. Sarah Nader- snader@shawmedia.com Tiffany Taller, 13, of Algonquin swims a lap while attending the Spring Swim Team Stroke Clinic at Sage YMCA in Crystal Lake Thursday, April 14, 2016. 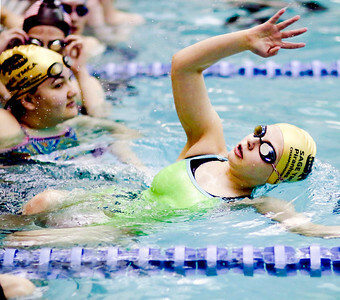 Tiffany Taller, 13, of Algonquin swims a lap while attending the Spring Swim Team Stroke Clinic at Sage YMCA in Crystal Lake Thursday, April 14, 2016.